ProPlenish Citrus Loose powder is 100% pure marine collagen with a hint of natural citrus for those looking for a touch of flavour. This 180g box of loose powder is perfect to have at home to add to food or drinks to restore your body with the nutrients it needs for a glowing complexion and a younger looking you. Purchase this product now and earn 90 VIP Reward Points! Simply add 1-3 scoops into your hot or cold food or drink each day, and watch as it works to reinvigorate your skin, hair and nails. Hair – strengthens hair at the root by restoring collagen in the hair follicle to aid hair growth, thickness, texture and body. Skin – rejuvenates, supports and strengthens skin. Aids in skin elasticity, smooth’s fine lines and wrinkles, tightens and evens out skin tone for long-term skin radiance. Help’s increase the skin’s ability to retain moisture for overall hydration, plumpness and resilience. Can help to reduce the effects of sun damage on the skin, as well as assist the appearance of stretch marks and aid wound healing. Nails – helps to improve and strengthen splitting, weak, flaking nails. Promotes accelerated growth. Health & Fitness – assists with lean muscle gain and tone, training and exercise recovery. Support tendons and ligaments, joint integrity and mobility as well as bone strength and joint flexibility. Can aid weight loss and management. See Additional Information tab above for nutritional panel. This 180g box of loose powder includes a pre-measured scoop. 100% natural ProPlenish® Marine Collagen (from fish), maltodextrin (from corn GF), natural flavour, acidity regulator (citric acid), natural sweetener (Stevia glycosides). Consciously formulated for your beauty, health and wellbeing, ProPlenish marine collagen citrus flavour is 100% natural and free of fat, carbs*, sugar, dairy, lactose, soy, wheat and gluten – free of everything except the benefits. Contains no artificial, colours, flavours, additives or preservatives. Click here for further nutritional information. *Please note the Citrus flavoured version of our product does contain a small amount of easily digestible carbohydrate – Maltodextrin (from corn, Gluten Free) and natural sweetener (less than 1g per serve). For optimum results include 1-3 scoops in your daily routine. Mix into water, smoothies, yoghurt or juices. 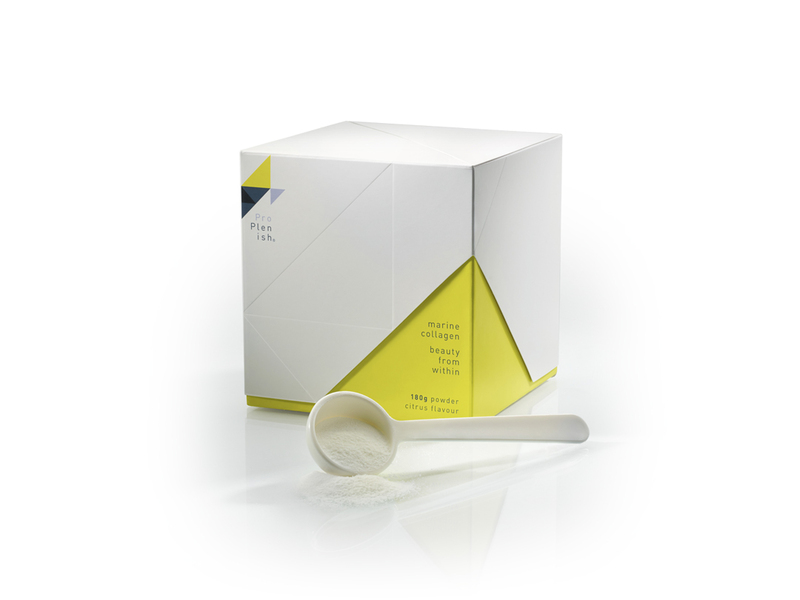 For complete inner and outer beauty use in conjunction with ProPlenish Swiss Snow Algae Anti-Ageing facemask.